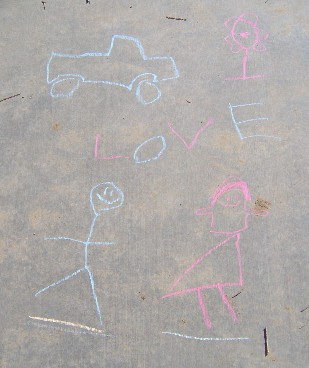 He drew this right outside our bedroom back door. He said, "Momma, I drew a picture for you and Daddy to see right outside your door. It says love because you and Daddy love each other and it has a truck for Daddy and a beautiful flower for you..come see..."
This is what it's all about, right? I went from having flat emotions today, to having my emotions soar to heights that only a child's true love can bring. I need that little 6 year old boy! What brings you joy...What makes your emotions move with pure bliss? What makes my emotions move with pure bliss? YOU do Lisa. You do. kids bring such happiness and joy! this made me smile. More Party Prep & the Cute Cake!